Watch our webinar outlining the new protections. As of January 1, 2018, would-be homeowners are protected from predatory rent-to-own contracts by a new state law that creates some of the strongest consumer safeguards in the nation when it comes to these contracts. Housing Action Illinois drafted and advocated for Senate Bill 885, which passed the Illinois General Assembly on May 31, 2017 and was then signed into law by Governor Rauner. SB 885 was also advocated for by Attorney General Lisa Madigan and others. Senator David Koehler (D-Peoria) was the bill’s chief sponsor in the Senate, while Representative Jehan Gordon-Booth (D-Peoria) was the chief sponsor in the House. 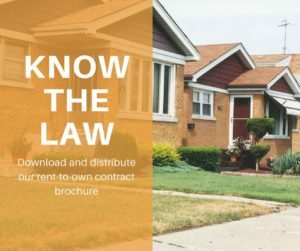 Predatory rent-to-own contracts have been making headlines lately; last year, the Chicago Reader published an investigative report on how contract-for-deed sales can be “immensely profitable” for investors but “rarely pan out for would-be home buyers,” offering unrealistic promises to families in neighborhoods that generally have high poverty rates and are racially segregated. The Chicago Sun-Times Editorial Board called on policymakers in Illinois to protect would-be-homeowners by passing SB 885. The problem has also grabbed national attention; the New York Times profiled a company undergoing legislative scrutiny for predatory rent-to-own contracts. In September 2017, the Metropolitan Planning Council, Woods Fund Chicago, and Polk Bros. Foundation, hosted a forum bringing together civic, government and community leaders to discuss contract buying as it exists today. Sharon Legenza, Executive Director of Housing Action Illinois, joined to share information about the new legislation and discuss education and implementation of the new law. “Illinois is leading by example by establishing some of the strongest protections in the nation for homeowners against predatory rent-to-own contracts,” says Palmer.